The featured title is an extract from the book of 2 Timothy 4:7 from the great Apostle Paul, who despite setbacks, imprisonment, shipwreck, and other obstacles he faced in life, his commitment and strength beyond his natural abilities were his testimony. During his lifetime, the Apostle Paul achieved accomplishments that many Christians today have come to know, trust, and believe in for our lives . . . A saving grace onward to obtaining a crown of righteousness. In August 2015 the National Association of American Veterans, Inc. featured a story of retired Navy Veteran Ernie Andrus. Photo retrieved from United States LST Association website (homepage) on August 8, 2015. Used with permission from Microsoft. This copy pulled from NAAV featured story from August 2015. 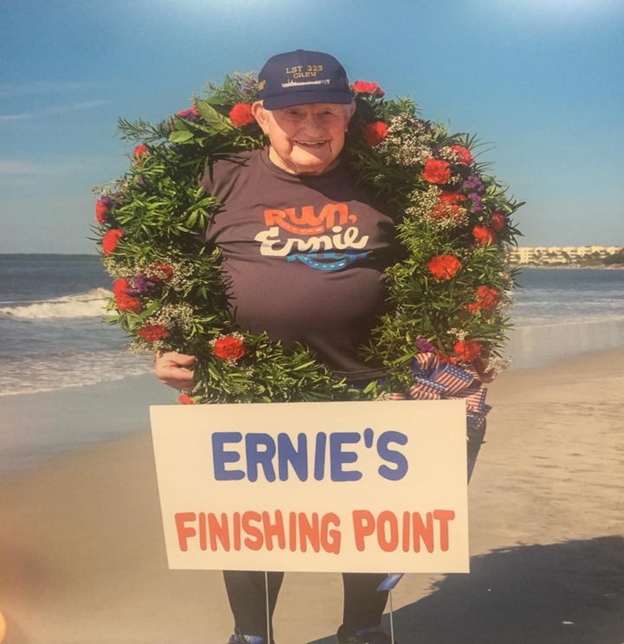 In September 2016, shortly after his 93rd birthday, Ernie set foot on the coast of St. Simons Island after an amazingly ambitious trek consisted of running three days a week, with an average of 6.13 miles per day and averaging about 18.4 miles a week. All along the way, Ernie had spectators and runners to cheer him on and keep him company for a few miles as he passed through streets and towns like a national celebrity. Although Ernie had a few setbacks in the beginning, including the unfortunate loss of his wife, Susan, like any dedicated solider, Ernie tighten up his shoestrings and persevered, enduring the race and maintaining a pace of 6-plus miles per day. He literally kept the faith and successfully completed his mission. Below is a picture of Ernie on the shores of the East Coast, receiving much justified recognition and congratulations on his heroic trek. The money he raised for the LST 325 was not quite enough to cover the ship’s voyage back to the shores of Normandy, but it was enough to cover some necessary restoration and detailing. Ernie has been blessed. He purchased a home in Sun Lakes County, as he was “so impressed by its beauty.” Now more determined and committed to finishing anything he sets his heart and mind to, 95-year-old Ernest Andrus is still on a mission to move forward. He’s running three days a week; however, instead of covering the 18 miles per week, he’s cut it back to 13 (Smile). “I have ran several 5K’s, a 10K, and three 200-mile relays. Lord willing, I will run another 200-mile relay next February . . . the Ragnar Del Sol in Arizona. I was guest speaker last November at the Pro Football Hall of Fame, Patriots Project. Met some real heroes there. NAAV is truly proud of Mr. Andrus’s accomplishments and story. He is the type of person who can give us all hope! “Very little money coming in now, but I haven’t given up on the project. So many friends have been telling me I should write a book.” A book, he says? We have no doubt that he is able, and we look forward to hearing more. We will allow Ernie the last few words of this featured story, because after all, it’s tribute to him: When I give a presentation, I find what most people are interested in is the Great Depression, World War II, and running, so I decided to make it an autobiography, thereby covering all three. If I live long enough to finish this book. I’m working on another project that could possibly raise enough money, probably not in my lifetime, but the LST was used right up through Vietnam, so maybe some of those Veterans will still be around. So there we have it—a lesson on finishing well and finishing what we have set out to do—whether it takes a year to complete or one day’s effort. Ernie Andrus is an example of the type of characteristic that NAAV sees in all of you, our supporters, sponsors, and volunteers. You have kept up with this organization and followed through during both the good and the hard seasons. 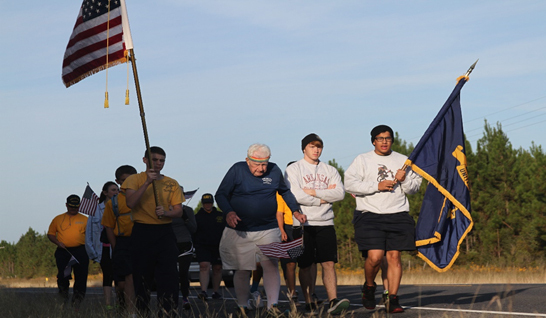 NAAV thanks you for not giving up, for keeping the pace, and adjusting your stride to come alongside us as we continue to be there our American Veterans and their family members who reach for assistance from coast to coast. Thank you for helping us to fill their cups in more ways than one. And a big thank-you from all of us at NAAV to Ret. Navy Corpsman Ernie Andrus for inspiring us all to, despite the obstacles, keep on moving until the mission is accomplished.